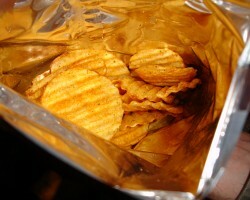 How can I reuse or recycle leftover chips? | How can I recycle this? How can I reuse or recycle leftover chips? Good thick chips not just tiny hard scraps. It’s such a waste. Can anything be done with them? Obviously the first thing here is to reduce the amount she & her family buy in the first place – but I realise chip portions are a variable thing. I read about a study recently that found that portion sizes could vary from between 250g (half a pound) to 1kg (2.2lbs!) depending on the shop and server. I think most families would have leftovers even if they bought just one bag of the latter! Whenever my father (not) in law has leftover chips, he wraps them back up in their paper again and freezes them for a snack at a later time. I’m not sure how he defrosts/reheats them (and admittedly, he’s not got particularly high standards when it comes to cooking) but it might be worth experimenting with if you have them leftover regularly. At the end of the day though, they’re just leftover fried potato – and can be reused like any other leftover potato. Mash up the softer ones – they could be used in fish cakes or a hash/bubble & squeak. The little hard ones could be chopped up and used as a crispy coating/topping. Here, they’d go in our “misc stuff for the chickens” pile. What would you do with leftover chips? Mostly they wind up in the chicken coop, the hens love them. But in the past I have used then to layer in a casserole. A layer of fries, TVP/ veggie layer and top with some cheese. Bake 30 minutes or so. These are home made fries, don’t ever buy the fast food kind. There was a restaurant that I frequented in high school that served burritos stuffed with beef and french fries/tater tots. Sounds weird but it was so so good. If you absolutely need warmth rather than food, most all potato chips I have encountered burn for very long and at high temperatures, perfect for getting a larger fire going. I have used as little as half a handful to light kindling to log sized dry wood. Every camper should bring along a bag of leftover chips just in case! I’d just put them in the fridge and microwave them later for a snack. Now, if I heated them in the oven instead, I’m sure they’d be much better, but I’m lazy. Not that I often have leftovers-when I get french fries, it’s usually a fairly small amount. I know you can make hash browns out of leftover baked or boiled potatos, maybe it’d work with the chips, too. Put in egg and cheese and what have you for a frittata sytle meal? Don´t miss the simplest way: Spanish omelette. Just add eggs, toss in a hot frying pan (some oil, please) and make as slower as you can, before turning upside down. Also great for leftover Chinese food! I call it Egg Foo Breakfast. Thank you thank you thank you!!!!! I’ve been searching ideas for ages, and even though our chooks would love them, I’d rather incorporate our leftover chips into tonights dinner, and a Spanish omelette sounds perfect!! I always buy a large portion of chips and freeze what’s left over for another time. This way I can take just a handful out for each meal to make them go further (and supplement with bread and butter if necessary). 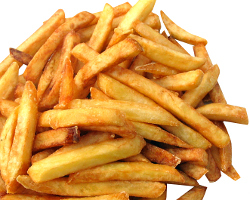 Put the chips in a frying pan on a LOW heat with a sprinkle of oil so they don’t burn, and toss from time to time. You may find a lid will help. The Spanish Tortilla (Omelette) is the best way to re-use chips. Fry some onions and peppers with it, mix it with eggs and a bit of milk, fry with olive oil and voila!! I call this left-over hash. I usually make it when I have leftovers from one or more these ingredients. 1. Fry up the french fries & any kind of meat, sausage/bacon/hotdogs (really any kind of left over meat). 3. Add veggies such as onions, mushrooms, bell peppers, fry until golden. 4. Add the french fry/meat back to the pan. Mix together. 5. Add salt & pepper to taste. 6. You may also wish to add some tomato sauce, and chilli powder. Old chips can be recycled into a great hotpot topping/crunchy potato side dish! Inspired by some of these suggestions, I just chopped up some leftover chips into smaller pieces, tossed them in a tiny bit of sunflower oil and bunged in a baking tray. They made lovely crunchy potato chunks, and you wouldn’t guess that they started off as chips! I served them with a mince & veggies mixture, so it was like a crunchy hotpot topping. It worked really well – I’ll definitely do it again, but next time would add maybe some finely sliced onion or a few cloves of garlic, and some herbs, and claim they are Spanish or French!